Renewable andSustainable Energy Reviews, Volume 51, November 2015, Pages. 263-272. We all love our cell phones, tablets, and flat screen TVs.Many of us also love to replace those gadgets every couple of years with thelatest and greatest new models. Around the world, 30 to 50 million tons ofelectronic devices are tossed away every year. That volume of e-waste isexpected to increase by an impressive three to five percent per year asconsumers demand more and more “smart” products. But where do all those olderelectronic devices end up? Too many of those devices today end up forgotten in a deskdrawer or, worse, in a landfill. But the authors of an Atlas award-winning reportpublished in Renewable and SustainableEnergy Reviews expect this to change. They’ve now conducted an economicassessment that lays the groundwork to assist in decision-making around e-wasterecycling programs designed to ensure that the valuable materials containedwithin electronic products will find a second life. “This paper is a cornerstone and crucial evidence base toreally inform society globally and encourage us to think about the amount ofembedded value and precious materials in the electronic products that weconsume on a daily basis,” said Lenny Koh of the Advanced Resource EfficiencyCentre at The University of Sheffield in the U.K. The European Union has made it a priority to work toward acircular economy, in which wastes are increasingly recognized as resources, andit’s clear that such an effort makes good sense when it comes to economics. Kohand her colleagues estimate potential revenues from recycled e-waste at morethan two billion Euros in the year 2014 for the European market alone. The value associated with those recycledresources is expected to rise by the year 2020 to more than 3.5 billion Euros.Smartphones, tablets and other popular electronic products contain preciousmaterials, including gold, copper, palladium, silver, platinum, cobalt, andmore. The researchers have developed a methodology to helporganizations identify these key materials and to prioritize their investmentin materials recovery based on factors including the amount of materials thatare available in waste streams, their material composition, the pricevolatility of recovered materials, degree of purity required, and more. They’verelied on their methodology to evaluate the potential revenues from therecovery of 14 popular e-products, including LCD and LED notebooks, TVs,computer monitors, cell phones and solar panels. Of course, the recycling of electronic waste products also promisesto reduce environmental pollution by conserving virgin resources, which are requiredfor the manufacturing of high-tech consumer products as well as for aerospace,automotive and other industries. As the demand for these limited resourcescontinues to rise, industry will be left with little choice but to capture recycledmaterials for manufacturing and to meet the demand for their new products. While the sheer volume of waste and the challenges ofmanaging a steady and growing stream of e-waste remain quite daunting, Koh saysshe is optimistic that this new framework together with market forces will pushe-waste recycling efforts forward. We spokewith Lenny Koh from the Advanced Resource Efficiency Centre at The Universityof Sheffield to find out more about e-waste and the opportunities and thechallenges in e-waste recycling now and into the future. When we say e-wastestreams, what are we really talking about? E-waste refers to material wastes from electronic equipment.In this paper, we look at 14 different types of products: including LED and LCDnotebooks, TVs, monitors and tablets in order to really identify the materialsthat can be recovered from those products once they are no longer in use. Thesecould be precious materials, critical materials and rare earth materials. How significant hasthis category of waste become? Material wastes have become extremely significant over the pastdecade. Now and into the future we are seeing an increased reliance on criticalmaterials, rare earth and precious materials. With innovation, the demand forthese materials has increased, but the supply is not increasing at the samerate as the demand. There is a limited supply in the world for certain types ofmaterials and it is crucial that industries operating in electronic equipmentand other sectors look at new ways of recycling, new ways of improving materialresource efficiency, and implementing the idea of circular economy in order torecover valuable waste from these products so that they can be purified androoted back into the supply chain. New industry will be emerging to tap intothis growing market, which is growing at a rate of three to five percent everyyear internationally. It’s not going to go away in the near future. How much value isthere in e-waste? The value is very, very significant. Let me give you afigure that will probably shock you. The potential revenue from the recyclingof e-waste is 2.15 billion Euros and it’s projected to grow significantly. By2020, the market for recycling of e-waste will grow to 3.67 billion Euros.There is an absolutely phenomenal opportunity in this sector and a bigchallenge in society to think about how we are going to deal with the increaseddemand for electronic products and e-waste. Was there anythingthat particularly surprised you along the way? What was illuminating or surprising in this analysis is we foundthat gold is having the highest influence in this economy. Gold accounts formore than half of the revenue from e-waste materials. The number of gold minesavailable is limited and they are often in particular geographic locations wherethere have been political tensions. Economic uncertainty can influence the availabilityof gold and the demand for gold continues to increase in a lot of products weare consuming. In our research, we ranked the top 10 materials and gold comesout on top. Other top 10 materials include copper, palladium, plastic, silverand aluminum. Many of us buy thesenew devices—cell phones, flat screen TVs, tablets, and so on—with littlethought to where they might eventually wind up. What can consumers do toimprove things? Increasing awareness by consumers is absolutely crucial. Weare promoting recycling, reuse and recovery. It’s critical that a recyclingplan is put in place so we can cope given the expectation that demand fromconsumers will increase with technological innovation. We need infrastructureand facilities to build our capacity for e-waste recycling. Consumers can alsowork together collaboratively with industry to drive the agenda of circulareconomy. Reliance on non-renewable, virgin materials is having a major impact onclimate change. There is only one planet we live on—not three at the moment.It’s crucial everyone in society plays a key role in this process and thatdefinitely includes consumers. 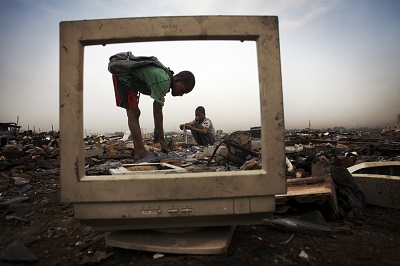 What do you see asthe biggest challenges when it comes to e-waste? One of the biggest challenges we come across in dealing withe-waste and circular economy is that the design of products is increasinglysophisticated, smaller, more compact on a nanoscale. This increases thecomplexity in recovering precious, rare earth materials. Technologicaldevelopment in this area is important in order to make sure we’ll be able todeal with complicated products and nanoscale materials we have to uncover, andthe recycling plants to have flexibility to cope with multi waste streams. How optimistic areyou that these waste resources will be put to good use? We are absolutely confident that the market demand for thisis there. Our research has shown the economic and financial value of doing itand the huge supply stream of waste projected going forward to 2020. Withincreased regulation pressure, policy change and awareness in ways to deal withwaste, I think the demand for recycled e-waste will keep increasing. Renewable & Sustainable Energy Reviews publishes review articles designed to bring together under one cover, current advances in the ever broadening field of renewable and sustainable energy. The coverage of the journal includes energy resources, applications and services, policy, environmental impact and sustainability.